Irish t-shirt is a women's junior size that features the humorous Leprechaun Madness! motif. This women's Irish t-shirt is an exclusive design of The Irish Gift House, that is enhanced with glow in the dark print. This Kelly green Irish t-shirt for women features 100% pre-shrunk cotton with a contoured fit. This junior size t-shirt, for an Irish girl, features the amusing Leprechaun Madness! design. 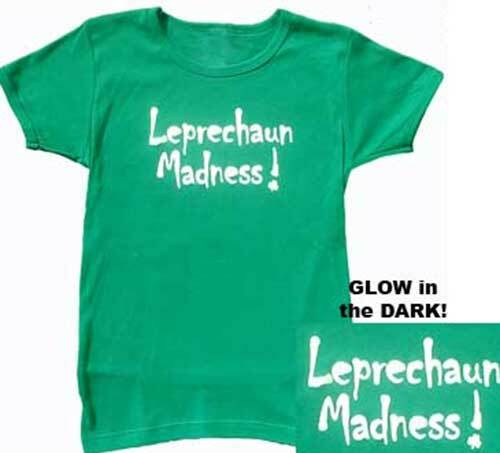 Irish t-shirt is a green design that features the glow in the dark Leprechaun Madness! motif. Junior size women's Irish t-shirt features a shamrock along with a humorous Irish girl caption. Junior size women's Irish t-shirt features a vertically printed Ireland and Celtic knot design.